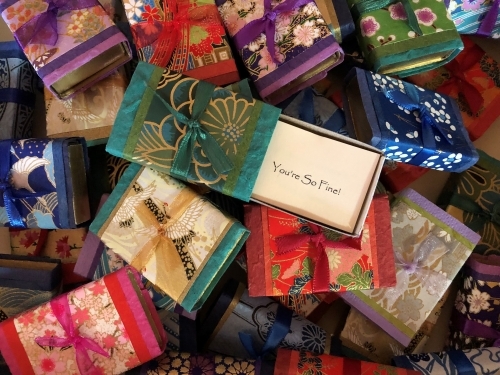 The most enticing little gift, these are little match boxes, wrapped with beautiful papers from around the world, tied with silk ribbon and packed with inspirational quotes~ from Walt Disney's "If you can dream it, you can do it" to Colette's "You will do foolish things, but do them with enthusiasm." The words of wisdom in each little box will often surprise you with their timely messages ~ like your own mini life-coach. This is the perfect gift for a growing child, a friend -- anyone who has dreams and aspirations. People have bought them for party favors, wedding favors and every member of their book club. They are a great stocking stuffer or gift to have on hand. There is a perfect balance of good advice and friendly humor: "The future belongs to those who believe in the beauty of their dreams," said Eleanor Roosevelt. " I am not what happened to me; I am what I choose to become-" said C.G. Jung. We all need to remember the Golden Rule, so it's tucked in there, as well as the good advice, "Be the change you want to see." Need extra confidence? Consider these words of Shakti Gawain, "The Universe will reward you for taking risks on its behalf." And there are many reminders to live life with gratitude, including the proverb: "Give thanks for the little and you will find you have a lot." 28 quotes in all keep people reaching for these boxes again and again. REFER TO Drop-Down Menu for bulk purchase discounts, perfect for party facors, weddings, corporate gits, life coaches and folks who just love to scatter joy and good cheer.